The James Bond actor shared a touching photo with his fellow 007 star. Daniel Craig has shared a touching tribute to Sir Roger Moore, who passed away on Wednesday (23 May) after losing a short battle with cancer. The Spectre actor shared an image with the late actor, who is famed for starring in the most James Bond films, writing: "Nobody Does It Better - love Daniel"
The official 007 Twitter account added: "We are heartbroken at the news of Sir Roger Moore’s passing. We shall miss him enormously. Our love and thoughts are with his family." Celebrities from across the entertainment world also shared their tributes for the late actor. Michael Caine wrote: "I am devastated today at loosing one of my oldest and closest friends ROGER MOORE, my world will never be the same again." I am devastated today at loosing one of my oldest and closest friends ROGER MOORE, my world will never be the same again. Sir Paul McCartney said: "Further sad news today that Sir Roger Moore has passed away. Roger was a great man and of course a great James Bond who I was lucky to work with during the time of 'Live and Let Die', He had a heart of gold, a great sense of humour and will be missed by the many people who loved him." 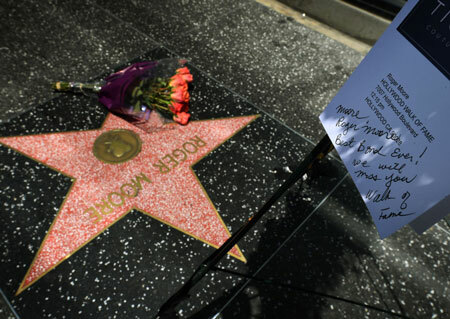 Meanwhile, flowers have been placed on Moore's star on the Hollywood Walk Of Fame. "Best Bond Ever! We will miss you.